When I picked up my Bible to do my Bible study for today, I immediately saw the word SURROUNDED. The passage was Hebrews 12:1-3, and I decided I would make this Scripture the subject of today’s Tuesday at Ten blog post, using the prompt word SURROUND. Did you know that you are surrounded? No, not by police who are about to break into the house. Not even by a crowd of friendly people that encircle you. No, as women who desire to walk by faith, we are SURROUNDED by a very special group of people. 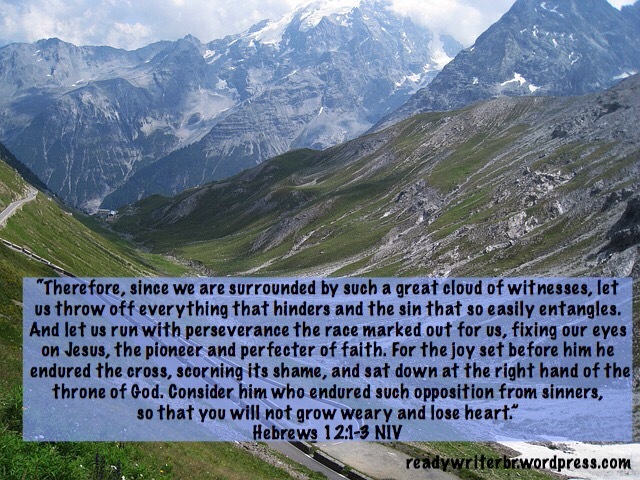 The author of Hebrews describes them as a great cloud of witnesses. And who is in that cloud? It includes Abraham, Sarah, Isaac, Jacob, Joseph, Moses, David and Samuel, among others. And what made these people special? They all lived by faith. So what is faith? Hebrews 11:1 says, “Now faith is the assurance of things hoped for, the conviction of things not seen.” Faith in God is both intellectual assent that He is real and trust in what He says about Himself. And these men and women of faith set us an example of how to live. Faith isn’t perfection. Abraham lied about Sarah saying she was his sister, and David committed the sin of adultery. These were sins, things God had to deal with in their lives. But every one of these men and women had this one thing right – they had faith in God. In case you’re wondering where I got this list of names, these are just a few of the men and women named in Hebrews 11. In the original text, the Bible was not divided into chapters. They were added later, alone with verses, to help us locate a particular passage. So Hebrews 12 is simply a continuation of Hebrews 11. These people are not dead – they have entered eternal life. The things they hoped for during their days on earth are now seen. But while on earth, they all faced big challenges, and by faith they obeyed God. By faith, they walked faithfully through less than ideal circumstances. And by faith, we also can walk in a way that pleases God, regardless of the circumstances we face. These verses give us some instructions concerning how to do this. Throw off everything that hinders. Is there something in your life that hinders you from doing the will of God, distractions that keep you from fulfilling His purpose? If so, these are encumbrances that need to be thrown off. (Throw off) the sin that so easily entangles. Sin is different than a distraction. For example, wanting to spend excess time with friends isn’t a sin, but if it’s keeping you from doing something that God has clearly instructed you to do, clearly it has become a distraction. In contrast, sin is a direct violation of God’s perfect standard. Are there any sins that trap you over and over? This is what the author of Hebrews was talking about, and these too need to be thrown off. Run with perseverance the race marked out for us. It may not be the race you would have chosen, but if God allowed it in your life you need to accept it and move forward. As Paul, near the end of his life was able to say, “I have fought the good fight, I have finished the race, I have kept the faith,” (2 Timothy 4:7), this should be our goal. For the joy set before him he endured the cross. Jesus looked forward to once again being in the presence of His Father, and this was Jesus’ source of joy, even as He hung on the cross paying the penalty for our sins. We also can find joy in the knowledge that we will one day be in the presence of God, because of what Jesus did. Until then, Jesus will give us grace and joy in the midst of circumstances we would not have chosen, when we surrender to His purposes and put our trust in Him. Consider him who endured such opposition from sinners , so that you will not grow weary and lose heart. I admit there are times when I grow weary of the health problems I face daily and I feel like giving up. But when I consider Jesus, when I think about all the hostility He faced from sinful men, just so He could pay the price for our salvation and restored relationship with the Heavenly Father, I am strengthened. If you are a child of God, it’s wise to surround yourself with other people of faith. But even if you are the only true Christian you know, you are still surrounded. And this great crowd of witnesses who went before us can teach us much about how to live a life of faith. Love the scripture and the whole idea of being surrounded by those great heroes of faith – I can see them now, cheering me on, telling me not to give up, and yes, everything I face here on earth is worth the prize of eternity with Jesus ! That is an encouraging image. Personally, I’m mostly glad that it’s done and posted. Don’t know when I’ve ever had so many problems with a blog post. Writing when I’m sick and have to stop to go to the doctor is definitely not an ideal situation.